The Social Media Tracker LinkedIn report allows admins of a LinkedIn page to see how well they engage with their followers. You can report on the followers, impressions, likes, clicks, shares, and comments on your page with this tab. The settings let you change the date range of analysis to the last 2, 7, 30, 60, or 90 days. Read the annotations below the chart to read how each part of the report functions. The four numbers at the top of the report compare your page’s total follower count at the end of the set date range to the previous amount of time. Followers change represents the difference between the two numbers, and the growth is how much your audience has grown relative to its size. This line graph shows your page’s organic and paid follower growth. Both types of followers will be shown in the graph. If you want to visualize only one type of follower, you can deselect a type with the colored box below the graph. This circle chart breaks down your page’s total engagement by the number of clicks, likes, shares, and comments on your posts over the set date range. The bar graphs to the right represent how much engagement occurred on each day. You can deselect any type of engagement from the chart with the colored boxes below the graphs if you just want to measure a specific kind of engagement you’re getting on LinkedIn. The Engagement rate graph indicates the change in engagement rate for your page over time. Engagement rate measures the amount of engagement your page receives, divided by your audience size. 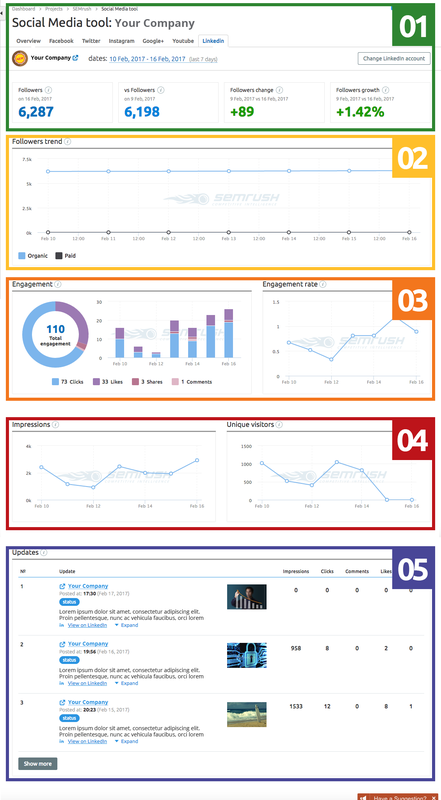 The next two line graphs measure your page’s impressions and unique visitors over the set date range. Both of these graphs represent positive types of engagement on LinkedIn. Impressions mean your posts are reaching people, and unique visitors represents how many people are checking out your business’ page. You can change the range of the graphs with the date settings at the top of the report. Finally you can view a table of your page’s updates on LinkedIn. Each update can be expanded or viewed on LinkedIn. These updates are sorted in order of when they were posted, with the most recent updates at the top. For each post, you can see how many impressions, clicks, comments, likes, and shares it got.